CGSB – Hands Off Our Harnesses! “Canadian Guide Dog” Update – What Have We Been Doing? The Canadian Federation of the Blind is pleased to make its conference line available for the next teleconference meeting of the “Hands Off Our Harnesses” coalition. Please pass this announcement along to anyone you know who is interested in ending the threat to human rights posed by the proposed Canadian General Standards Board service dog standards. To join the conference, phone (204) 666-2094. If you do not have access to a cross-Canada calling plan, feel free to use our toll-free number (800) 898-8212. In either case, the access pin is 7124#. Anyone is welcome to join the call, but the job of the chair will be made easier if you RSVP to info@hooh.ca . Thanks to Heather Walkus for providing the following agenda and to Yvonne Peters for chairing the call. 8:30 pm Newfoundland and Labrador. The Chair may call on specific people to add comments during the presentations and will ensure after each section of reporting is completed, go around the table and call on each member Province to Province to ensure everyone will have an opportunity to speak, ask questions and add comments 3 times throughout the meeting. This will avoid crosstalk and ensure every person can speak and be heard. b) Chair will ask each person in a quick Round Table reporting from Coalition members on what each person has done including contacting MP’s etc. c) Chair will go around the table to get final input from members regarding development of the strategy and planning for the next round of draft standards, the ongoing political work and possibility of a legal challenge. Expected Outcomes of the Coalition/Government working group as presented on Nov 9th 2017, Conference Call. This first meeting was the opportunity for the Guide Dog Handler and Service Dog Handler Coalition Representatives to present the history background and context to our expected outcomes required to fix the failed standards. It was agreed by all there will be another meeting of this working group in mid January 2018 in order for the Government to review the multi-faceted issues that have impacted us as stated in our presentation and to discuss how the Government will proceed on the expected outcomes. This begins with enacting our number one expectation of immediate exemption. 1) The immediately exemption of all Guide Dog Teams and Service Dog Teams in Canada from the CGSB standards. 3) Suspend or stop completely the standards process and instead have a robust Social Policy process together with Veterans, expertise within the broader community and managed by the CHRC to ensure the training support for Veterans is relevant and is aligned with UNCRPD. 4) Included with above begin capacity building with existing Service Dog Schools and Veterans to support effective training outcomes for Veterans Dogs which can lead to support of all Canadians requiring well trained Specialized Service Dogs. The most recent, sixth committee meeting was held from September 20 to 22, 2017 in Gatineau, Quebec. The following points summarize the key outcomes from the sixth meeting of the Canadian General Standards Board (CGSB) Committee on Service Dogs held from September 20 to 22, 2017, and help explain the progress made to date on this Standards development work. The comments from the first Public Review period were discussed and reviewed by the Committee. In addition, it was noted that comments received in any format and even comments received after the Public Review period officially closed were considered. During this discussion at the meeting, all members and guests were given an opportunity to provide their feedback and feelings on the process and draft standard. In particular, the Committee heard that the Standard must address human rights concerns which were raised, and action must be taken to consider existing industry certifications that many Guide and Service Dog users have obtained. It was determined that going forward, the Standard should have a companion document that will act as information to users, stakeholders and regulators. This document will speak about the ability to recognize equivalencies regarding certification and that there is no intent for the Standard to introduce duplicate certification requirements in Canada from existing recognized international schools. This document will also help in clarifying the role of a National Standard versus Regulation. Furthermore, it will provide an informative component consisting of background on the development of the Standard, as well as an education piece on the spirit of inclusivity in Canada and creating a barrier-free system. Prior to the second Public Review period, the Canadian Human Rights Commission, as well as the Human Rights division of Justice Canada have both agreed to review the next draft document for any concerns. The companion document will be included with the second draft at the Public Review period with the purpose of providing guidance to anyone reading the draft and an explanation for all stakeholders. A second Public Review period will be held at the beginning of 2018 to allow all stakeholders 60 days to comment on the second, revised draft National Standard. This Public Review will be made accessible via the CGSB website with a draft in HTML, as well as PDF and Word documents available upon request. Unlike the first Public Review period, there will not be an HTML comment form on the website as this created some challenges for stakeholders to submit comments. The comments will be received by CGSB in any format, although a clause by clause break down remains the preferred method. The seventh CGSB Committee meeting is scheduled to be held later in 2018, for the purpose of reviewing the comments received during the second Public Review period. A B.C. woman claims her daughters faced discrimination when the company that manages their strata unit fined them for keeping two therapy dogs. The strata unit where the family lives does not allow pets, including dogs. The mother and her daughters moved into the unit in 2014, according to tribunal documents, three years after strata bylaws were amended to prohibit pets. They claim they were not aware of the rule as the unit’s previous owner had a dog that had been “grandfathered” into the complex after the pet policy changed. But the two small therapy dogs soon led to noise complaints from the neighbours. Between 2015 and 2016, the family racked up several bylaw infractions, including fines totalling $9,800. In response, the woman showed the management company a certificate confirming her daughter’s bipolar disorder. The strata reviewed the documents, but decided the dogs had to go “due to the negative impact … on other residents.” It offered to waive the fines if the woman removed the pets by March 6, 2016. But the strata was unmoved. Earlier this year, the woman filed the human rights complaint alleging “discrimination regarding service, accommodation or facility on the basis of mental disability.” In October, the tribunal ruled the complaint could proceed to a hearing. It’s not the first time emotional support dogs have come up at the B.C. Human Rights Tribunal. In 2016, the quasi-judicial human rights body ruled against a woman who claimed her son’s pit bull “Coco” was a service dog and that its removal by her strata would send the recovering heroin addict into a downward spiral. While the woman lost her case due to a lack of evidence, the tribunal was willing to consider the argument that a person with a disability may be entitled to keep a pet, even when it is not a certified service dog. The blurring of the line between legitimate service dogs and emotional support dogs — or therapy dogs as they’re sometimes called — causes problems for people with certified service dogs, said Tara Doherty, spokesperson for Pacific Assistance Dogs Society (PADs), one of the two accredited service dog schools in the province, along with B.C. & Alberta Guide Dog Services. Recent B.C. legislation has cracked down on “service dog fraud” — when people misrepresent their pet as a service dog in order to bypass no-pet rules — but it still happens, she said. Service dog ID cards and vests are available to anyone on an American website for less than $100, but the ID is not valid in B.C. To be certified under B.C. law, service dogs must come from an accredited school, or an owner must make an application to the province and the dog must undergo a testing process at the Justice Institute. The certification looks similar to a drivers’ license, and PADs supports work to educate businesses and strata councils to recognize a legitimate government ID from one purchased over the internet. Posted on the Public Services and Procurement Canada site, October 26, 2017. 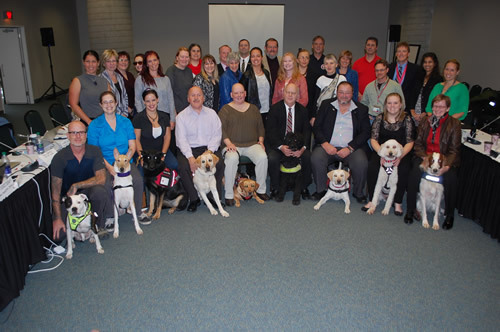 The CGSB Committee on Service Dogs is pictured here from a 2015 meeting. The most recent, sixth committee meeting was held from September 20 to 22, 2017 in Gatineau, Quebec. A second Public Review period will be held prior to the end of 2017 to allow all stakeholders 60 days to comment on the second, revised draft National Standard. This Public Review will be made accessible via the CGSB website with a draft in HTML, as well as PDF and Word documents available upon request. Unlike the first Public Review period, there will not be an HTML comment form on the website as this created some challenges for stakeholders to submit comments. The comments will be received by CGSB in any format, although a clause by clause break down remains the preferred method. The seventh CGSB Committee meeting is scheduled to be held in early 2018, for the purpose of reviewing the comments received during the second Public Review period. We would like to thank you for the opportunity to provide comments on the work the CGSB is undertaking related to access to service animals and public access for people who use service animals. We also appreciate the invitation to comment on the draft national service dog standard which you are writing. This is an extremely important topic for many persons with disabilities in all jurisdictions across Canada. As you know, we have been urging a human rights-based approach to this work. We believe a human rights-based approach should underpin the content of the standard and it should also frame the process used to develop it. The CHRC attended the 6th meeting of the Technical Committee as an observer to see how the comments from the public consultation were considered. The CHRC did not have the opportunity to read all of the comments, but we understand they covered all aspects of the draft standard including: mandate, scope, content and process. We see the public consultation as an extremely valuable part of the process and the volume of comments an indication that more work needs to be done. We wanted to share with you our concerns, and we hope that the concrete recommendations we offer will be helpful. In general, we recommend that you revisit the process and the draft standard itself, to ensure a more human rights based approach. The comments and recommendations we are providing (see attached) are based on the information currently available to us and may not be aligned with your current plans to move forward. We welcome any opportunity to learn more about your consultation and drafting process. Once again, we thank you for the opportunity to offer our views. We would welcome the opportunity to have a more fulsome discussion to help us fill in the gaps in our knowledge and discuss how the CGSB can better meet its human rights obligations. The CHRC has concerns that the process the CGSB has undertaken: has not sufficiently consulted, included, and considered the views of those persons with disabilities affected by the standard, and; will not produce a standard that protects human rights. Further, we are concerned that the process so far, and the draft standard?especially if implemented widely–could create, rather than remove, barriers for persons with disabilities. Our specific concerns and recommendations are included below. The CHRC understands the draft standard was first developed for Veterans? Affairs with the goal of ensuring that Veterans have access to quality service animals and to provide assurance that the psychiatric service dogs being provided to veterans are properly trained and meet appropriate behaviour requirements. We support this work, which can improve the daily lives of veterans. We do not want to create a barrier or slow down the access to service animals for veterans. However, while the CHRC has only observed one technical committee meeting, we feel that the community of service dog users/providers could benefit from a larger policy discussion to identify the scope of issues related to service dogs to explore whether, for example, standardization is the best solution to reach the goal. It is not clear, based on the information we have, whether other options to a standard were ever discussed. We also noted that the scope of the project appears to have changed and grown from its original focus, and has attempted to engage in standards discussions for wider populations. The CHRC has also not received information that assures us that a rigorous policy analysis was undertaken to inform the process or the proposed standard. As some of the stakeholders at the technical committee meeting suggested, the CHRC would recommend the CGSB pause to reflect and ensure the process undertaken is the right one to meet the goal, and that the standard covers the appropriate scope. In light of this, we would make the following specific recommendations. We recommend that, as was suggested by a stakeholder in the technical committee meeting, CGSB roll the scope of this particular standard back to its original and more focussed purpose. This could provide time for a larger policy discussion but at the same time allow the draft standard to be piloted for a specific population: veterans. In any pilot of the standard, we recommend that the standard be evaluated and reviewed with stakeholders within a year, using a human rights framework. It should also be re-assessed in the context of any broader policy discussions that may take place, and updated to align with any newer relevant standards. For the larger policy discussion, the CHRC recommends that the CGSB situate this work more squarely within the broader government agenda to develop accessibility legislation to make Canada a more inclusive society. To ensure that the landscape is more fully understood, the CHRC recommends that the CGSB undertake additional research and policy analysis and in particular, prepare a scan of the legal, regulatory, social, political, economic, jurisdictional, and technological facets of the issues that should be taken into consideration in developing a standard that is most helpful to remove barriers and support inclusion and equality. We also urge the CGSB to work with ESDC and Veterans Affairs Canada to engage with the provinces and stakeholders to consider the scope of issues raised, the problems and barriers, and to explore all relevant possible policy solutions in the current context. This discussion should be accessible to a wide variety of stakeholders, be transparent and ensure that any next steps are not creating barriers for persons with disabilities. The proposed draft standards, as they currently stand, do not reflect fundamental human rights principles articulated in the UNCRPD or domestic human rights legislation. For example, the standards do not recognize that persons with disabilities have the right to use a service animal to assist them in functioning with dignity and independence in society, nor that persons with service animals have the right to access services and employment without discrimination. It is the view of the CHRC that treating someone with a service animal adversely or refusing to accommodate them to the point of undue hardship could amount to discrimination prohibited under the Canadian Human Rights Act (CHRA). The CGSB must keep in mind that even if the standard is met, the standard itself may be discriminatory and furthermore it does not eliminate the duty to accommodate. To ensure that any future standard is relevant and provides appropriate guidelines to government and members of the industry, the CHRC recommends that the CGSB refer to the purpose and principles of the UN CRPD and embed these more clearly and thoroughly in the draft standard and its process. The CHRC has concerns about the consultation process used to develop the proposed draft standards. The CHRC believes that it is essential that initiatives and standards such as these be developed with the full and meaningful participation of those who rely on service animals. We recommend that CGSB more thoroughly review, consider, integrate, and respond to the concerns of stakeholders raised in the detailed submissions received. We would recommend that CGSB specifically reflect on and respond to the submissions provided by: the Manitoba Human Rights Commission; Jim Menzies (Canadian Service Dog Standard: A Failed Process) and; the article by James A Kutsch (Additional Regulation Isn?t Necessary to Resolve the Issue of Fake Service Animals). These documents in particular, highlight some of the concerns we share with stakeholders. How can a more inclusive process be undertaken that ensures diverse groups of stakeholders are around the table? How can the process support meaningful dialogue that considers intersectionality needs and supports persons in vulnerable circumstances? How is the CGSB ensuring the coordination/participation of all jurisdictions which is critical to develop a national approach? This summer many of us were alarmed by concerns expressed by US guide dog schools regarding their ability to continue serving Canadians should the CGSB standards be adopted. Guide Dogs for the Blind relieved many graduates when they announced that they would never abandon their Canadian students. How has the recent statement from GDB changed things? Not at all! Though fear that Canadians would be denied access to American schools was one of the elements that made us reject the CGSB standards, it was by no means our only, and not even our major, reason for raising the alarm. Our position remains unchanged. The process for developing standards was not a legitimate public policy process. The standards themselves frequently conflict with good training standards developed by IGDF schools. The proposed redundant testing and recertification protocols are intrusive, degrading, and treat those with guide dogs as childlike people who must be monitored, instead of regarding guide dog handlers as competent blind adults whose choice of a means of independent mobility should be affirmed and supported. All guide dog schools continue to oppose the original draft standards. We are gratified that the schools share our perspective on how the proposed standards will negatively impact graduates. This coalition is a voluntary group of individuals who have taken the time and trouble to inform ourselves about a process and its outcome. We have learned more than most Canadians know about standard setting because misuse of the standard setting process endangers our right to do something as fundamental as walking around. Our most grave problem with the proposed standards continues to be that they are written in a manner and process that is totally devoid of understanding and respect for human rights principles. All organizations of blind Canadians who have spoken publicly have expressed opposition to this process, yet it continues behind closed doors under nondisclosure agreements. As the people whose rights are being directly and profoundly violated, the members of this coalition will continue to stand. Human rights issues remain the centrepiece of our opposition to CGSB’s uninformed and illegitimate intrusion into our lives. We reaffirm our position that these standards must be withdrawn. Though school comments help inform our independent decisions as individual handlers, we are not defined by what the schools have to say. The schools have their own reasons for opposing these standards. If their objections can be overcome and the schools determine that they can live with any future version of CGSB standards, we understand their institutional necessities. We continue to wish the schools well and value our relationship with them. Our support for IGDF standards as wholly adequate remains firm. However, we remain independent thinking individuals who will make evaluations of any future proposed standards based on an informed understanding of our personal and collective best interests as handlers. Our interests frequently parallel the interests of the schools. On those occasions when they do not, we will continue to raise our voices in affirmation of our unique position as the people who work with guide dogs every day. Firstly, on behalf of the International Guide Dog Federation (IGDF), I welcome the opportunity to comment on the Draft Standard created by CGSB in relation to Service Dog Teams. In order to advise the CGSB of the credentials that the International Guide Dog Federation has in providing feedback on the proposed standard, we would offer the following background information. The idea of the International Federation of Guide Dog Schools for the Blind (IFGDSB) – as it was originally known – stems from conferences held in France (1973) and London (1976). At the conclusion of the third international conference in Vienna in 1983, attendees agreed the formation of a European-based group to consider “the formulation of guidelines and standards for the training of dogs and to teach blind people the use of dogs”. It was recognised and acknowledged by the professionals producing guide dogs that a blind person had special and very particular requirements of a guide dog. A blind person needed to rely on the dog to safely guide them across a busy road consistently, to safely indicate the beginning and end of a flight of stairs (or an escalator), to avoid dangerous obstacles or trip hazards and not be distracted from the task of guiding. If a dog was inadequate in performing any of these tasks, then the blind person could potentially be seriously injured or even killed. At the same time, the dog had to behave and be presentable in public and not pose a threat to members of the community. Much work was done from the 1920’s to determine the most appropriate behaviours to select for in breeding and the best training techniques to produce a guide dog that satisfied the requirements. For example, breeding to select for dogs with minimal dog distraction, food distraction or prey instinct reduced the chance that the dog would be distracted while guiding, etc. Training techniques used by trainers of many animals were investigated to develop the most effective way of training guide dogs, from 8 weeks of age, to focus on indicating hazards in a blind person’s path, indicating stairs and hesitating at a road crossing and then crossing in the most direct route when determined safe, etc. The wealth of over 100 years of accumulated international knowledge by the best experts in the world on guide dogs on the subjects of breeding, training of dogs and training of trainers, dog care, etc., have been embedded into the IGDF standards. In 1992, formal inspection of member schools began utilising these IGDF standards and, where standards were met, schools were accredited by a trained assessor in line with agreed operational guidelines. Where standards were not met, action plans were agreed or membership was revoked. As at the end of 2016, there are 91 member organisations (operating in 29 countries), 4 affiliate organisations and a further 29 organisations working towards achieving the standards set by the IGDF and, thereby, aiming for accredited membership. Through these organisations, IGDF currently represents around 25,000 guide dog users currently working throughout the world. In supporting these aims, one of the formal sub-committees of the IGDF is the Development Committee (DC). Through the DC, individual organisations seeking IGDF membership are afforded ‘expert’ advice and guidance in developing their services such that they do, indeed, meet the high standards required. Collectively, the knowledge and experience of the modern guide dog movement can be traced back for more than 100 years. This knowledge and experience has led to the IGDF, as it stands today, representing the highest level of expertise within an extremely specialised field and with proven standards by which all members are measured. The International Guide Dog Federation (IGDF) is the industry-elected peak body responsible for the development, monitoring and evaluation of the standards applied within all IGDF-member organisations, in order to ensure equity of high-quality service to guide dog users and handlers around the world. It can take many years for a new organisation to achieve the required standards which will enable them to become an IGDF Member – and only following in-depth assessment by another of our ‘expert’ sub-committees (Accreditation Committee – AC). All member organisations are then re-assessed on a 5-yearly basis to ensure that the standards are maintained before their ongoing accreditation is approved. These standards are continually monitored, reviewed and updated. With the re-assurance that comes from a graduated dog / handler team from an IGDF member organisation, comes increased confidence – both for the individual relying upon their guide dog for safe, independent travel and, also, the wider public who need to know that the dog comes from a solid background which includes significant ‘public access’ training / testing and has been raised to the highest standards of health and welfare. Ongoing assessment – both for the continued accreditation of a member organisation and, also, individual follow-up of each working dog / handler team – ensures that the high standards required are maintained. IGDF standards are set, evaluated and reviewed such that quality, service and expectation is considered on a worldwide level – thus enabling equal access to international travel for all, regardless of a need to rely upon a guide dog for an individual’s independence. There is neither acknowledgement, nor recognition of current IGDF (or ADI) standards. The proposal lacks clarity on its impact, strategies and governance. Focused on standardisation of the service dog team (which proposes to protect the public, the user and service dogs). Posits that wait times led to some trainers now entering the field that do not have the appropriate experience and education, resulting in self-trained teams without assistance and ‘fraudulent’ teams – whereby dogs are passed off as ‘service dogs’ but have had no relevant / formal training. Provides a basic benchmark for the performance of a service dog team but this is primarily focused on ‘simple’ obedience and a (one-off?) test for public access. The assessments appear onerous (for example – a veterinarian must provide proof that the dog is free from immediate or chronic stress, fear, anxiety, or discomfort, free of conditions that may interfere with their ability to work or may put the public at risk?). The proposed standard is voluntary at this time but, presumably, the intent is for regulators to use these standards as a basis for future regulation development. There is no focus on efficacy of tasks but it does provide a list of common tasks for different types of assistance dogs. Specifically prohibits “positive punishment” and “negative reinforcement”. This would not allow for leash/collar corrections or the use of the word “no”. In the case of asking a dog to lie down, you would be prohibited from exerting any downward pressure with the collar. This is completely unrealistic as the majority of assistance dog users would not be able to adhere to this (or, crucially, pass the test). What are the actual qualifications for the assessor and who is responsible for the assessment to occur? Who reviews the assessment reports and what are their qualifications? Is there a formal appeals process? Requires the assessor to verify the handler’s disability through a signed statement by a physician that they have a disability that may be mitigated through the use of service dog. How is that determined? Will the physician be required to assess the functional limitations of the person with the disability (which a dog would mitigate) or just the clinical diagnosis (which may not be relevant)? How often do the assessments need to take place? Does this only happen at the beginning of the team’s life together? What is the frequency of testing? What is the scale for determining whether the team has passed the inspection? How many things have to be passed? Are any failures acceptable? How do you determine the appropriate “matching” based on the chart and ratings? How will the assessments even be implemented? Who are the assessors? Will they work for a governmental agency? How will the assessors be trained? Is this grandfathered…or do all service dog users in Canada need to be assessed now? How many are in use currently? How is the assessment addressing the actual tasks required of the graduated team? Are those to be graded as well? Who is working on that? What is the provision for ongoing revision of the standards? How will this affect the organisations that are currently providing dogs to the Canadian market? Will they possibly discontinue training Canadian clients? This is at odds with the stated objective at the beginning of the standard document. The standard appears to be at odds with disability discrimination legislation around the world, by which guide dog teams are permitted access based upon the high standard of training they receive from, in particular, IGDF member organisations. This proposal will have a likely detrimental impact upon visitors to Canada and, also, Canadian Guide Dog Users wishing to visit other countries. The proposed standard does not allow for the recognition of any other global standard. It appears to be an attempt at an outcome standard but inherent with that direction is its focus on the human / dog team’s ability to behave and function in public areas (but in this case, very little focus on the dogs’ ability to perform the required tasks). IGDF has struggled with the development of a specific outcome standard as it is difficult to find ways to implement an accreditation. The ultimate outcome in any of our programs is how the handler and dog function together and whether this leads to enhanced mobility and an increase of independence for the individual. Ongoing follow-up for the working life of a guide dog team monitors and evaluates each case in line with the current standards. IGDF standards are a code of practice and we have avoided being highly prescriptive to allow for required flexibility in individual application while offering indicative benchmarks. For example, the requirement of a blind person using a guide dog in a quiet / rural location is very different from someone using a guide dog in a busy / city environment. IGDF promote best practices learned through all of our shared experiences and providing for standards that can be applied around the globe. In addition, IGDF standards cover the many aspects of running a guide dog programme that are outside of the outcomes of individual teams (breeding, puppy rearing, training, aftercare, initial and ongoing staff development, etc.) – all important aspects of providing safe and effective guide dogs. We understand that the Canadian Association of Guide Dog and Assistance Dogs strongly oppose these standards and, it appears, most of those organizations found out about this Board convening well after it had started its work. To that end, the proposal cannot be considered to be an inclusive endeavour. The IGDF supports this view. Much of the “inspection” is unrealistic and would require considerable time and resources. A good example is the “Behavioural Evaluation” that suggests a different person be involved with as many as nine different tests in areas where the service dog does not reside or normally inhabit. Many of the other stipulations appear to not take visually impaired handlers into consideration, which, had the Canadian Association of Guide Dog and Assistance Dogs been involved from the outset, could have been avoided. On top of that, can we imagine the stress and anxiety this would cause consumers? Why should they be put in the position of having to justify the accommodation of an assistance dog when the majority of them are going about their lives just fine? Is the Canadian government prepared to withhold the issuance of an identification card legitimizing a team when they have been traveling successfully for years because they failed a few points on the inspection? Is the test to be repeated periodically during the working life of the dog? Having said all of that, we do respect much of the work that has been accomplished by the committee around these standards. I could see incorporating some aspects into our own standards and they do provide a structure for the assessment of clients, the education that needs to be delivered by programs and outcome expectations related to appropriate guide dog behaviour in public areas. IGDF strongly recommends that the Canadian Standards Board fully recognise the IGDF and their proven, tried and tested, standards and, should the proposed CGSB standard be progressed, there should be no additional testing of graduates from member schools. IGDF therefore respectfully proposes that the Canadian Standards Board recognises the IGDF standards, with their graduates being exempt from this regulation. The draft proposal may then be developed to certify (or not) owner-trained teams or non-IGDF member teams – an effective ‘marriage of convenience’, perhaps? At the same time, this could promote the benefits of IGDF membership to new organisations and, through the detailed accreditation process, encourage higher standards and expectations for all.